PT Bank Pembangunan Daerah Jawa Barat dan Banten Tbk - PT Bank BJB Tbk (IDX:BJBR) or more popularly called "Bank BJB" is a rapid growing public-listed financial services company in Indonesia with strong business focus on general banking industry. 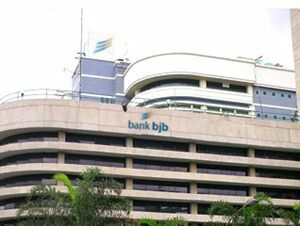 Based in Bandung West Java, Bank BJB is majority owned by the regional government (provincial, regency and municipal) in the West Java and Banten provinces. As today, Bank BJB is 38.26% owned by the West Java Provincial Government, 23.61% by the Regency/Municipal Governments in West Java Province, 5.37% by the Banten Provincial Government, 7.76% by the Regency/Municipal Government in Banten Province, and 25% by general publics. As of December 2015, Bank BJB runs its business through 62 branch offices, 312 sub branch offices, 326 cash units, 134 payment points, 11 Mobile Cash Service Units, and 1,204 Bank BJB ATMs throughout Indonesia. In term of financial performance, Bank BJB succeeded in achieving acceptable and sound growth in the third quarter of 2016 (Q3 2016, ended in 30 September 2016). Bank BJB has successfully booked total net profit of Rp 1,392 billion in Q3 2016, According to PT Bank Pembangunan Daerah Jawa Barat dan Banten Tbk Analyst Meeting Q3 2016 Presentation as cited by JobsCDC.com. This total net profit reflected an 55.6% increase from Rp 895 billion in Q3 2015. Referring to its presentation, Bank BJB's total net interest income in Q3 2016 amounted to Rp 4,216 billion or increased 27.3% compared to the achievement in the same period previous year (Q3 2015) of Rp 3,313 billion. Minimum Bachelor Degree (S1) with GPA min. 3.00 for (for bachelor degree/S1) and 3.25 (for master degree/S2) within 4.00 scales. Minimum height 160 cm (Female); 170 cm (Male) and weight proportional. Maximum age: 25 years for S1; and 27 years for S2. Graduated from a leading College (minimum accredited) with the educational background of all disciplines, except; Health Sciences / Nursing, Literature, Art / Culture, Education / Pedagogy and Religious. Not married and willing not to get married during the training and bond period. The candidate with prior experience minimum of 1 year in banking industry is preferred, especially in the business position (AO / RO / ARM / Credit Risk). Willing to be placed around the working area Bank BJB. GPA min. 3.00 for (for bachelor degree/S1) and 3.25 (for master degree/S2) within 4.00 scales. Graduated from a leading College (minimum accredited) with the educational background of Statistics, Mathematics, Law and Accounting. Placement at Bandung and Jakarta. Minimum 3 years of experience in similar fields (RM / RO / AO / CR). Experienced in lending banking in the business sector : Plantation, Shipping, Oil and Gas, Mining, Telecommunications, Manufacturing, Automotive and Corporate sector and other Commercial. Strong communication and negotiation skills and achievement-oriented targets. Minimum 3 years of experience in similar fields. Experience in credit analysis in business sector Plantation, Shipping, Oil and Gas, Mining, Telecommunications, Manufacturing, Automotive, property and Corporate sector and other Commercial. Possess certification in BSMR level 1 is preferred. Minimum Bachelor Degree (S1) from a leading Universities with a background in education majoring in Law. Minimum 3 years of experience in the field of litigation, especially banking law. Preferably for those who have passed the special education advocate profession or Master of Notary. For placement of Bandung, Jakarta, Serang, Cirebon and Surabaya. Have a minimum of 3 years experience in Banking industry and minimum 2 years in the position of credit recovery / collector. Have attended training in redit recovery and collector is preferred. Able to ride two-wheeled motor vehicles and have SIM C (Preferably have two-wheeled motor vehicle). Minimum Bachelor Degree (S1) with GPA min. 2.75 for (for bachelor degree/S1) and 3.00 (for master degree/S2) within 4.00 scales. Minimum height 155 cm (Female); 165 cm (Male) and weight proportional. Retirement age in 45 years. Minimum Diploma Degree (D3) with GPA min. 2.75 within 4.00 scales. Maximum age: 23 years for D3; and 25 years for S1. Retirement age in 36 years. Strong interpersonal, communication and organizational capabilities. Healthy physically and spiritually and free from the influence of narcotics and other addictive substances. Demonstrated good integrity, disciplined and committed. Willing to be placed throughout a network of offices working area Bank BJB. Pass all recruitment selection process held by Bank BJB. Never has a criminal record in the police. JobsCDC.com now available on android device. Download now on Google Play here. Please be aware of recruitment fraud. The entire stage of this selection process is free of charge. PT Bank BJB Tbk - Development Program, Fresh Graduate, Experience Hire BJB March 2017 will never ask for fees or upfront payments for any purposes during the recruitment process such as transportation and accommodation.